It was certainly getting warm now that the winter was over and the summer could arise from the shadows. A breeze flew over the Northern Ridge, ruffling the fur of one tough female. Her coat of mixed browns and whites moved as the wind interrupted it's peace, and as Terah moved stealthily down the slope. She'd been traveling alone for about a day now, just recently having split up with a new friend she had made on her travels. Her friend hadn't wanted to cross the mountains, knowing perfectly the hazards. But Terah pressed forward, it was a sort of adventure. Her day was composed of steep ledges and plenty of sharp rocks. Luckily, Terah knew how to tread lightly, and in the perfect places. She knew what she was doing, skills from the old valley were showing greatly. Although there were still some places where she lost her balance and tripped. Only a few scratches were her prize from those trips, and even still, she forgot about the hurt after walking it off. Her nose could tell that she was at the edge of a territory now. Maybe she could stay with this one for now, she thought as exhaustion began it's wave over her. Old age was starting to get to her, and that wasn't well for a traveler. She was at the top of the ridge now, staring down at the beautiful landscape before her. It reminded her a lot of the old valley, with a diverse mix of terrain and land. It was a matter of time before she was at the bottom, sitting by herself just by the border. She looked down to her legs and began to lick the most recent scratches and prizes from her trip here. It would only be a short time before she decided to give a short howl, just to let the pack know she was here. Terah was okay with discovering this pack. Blitz was on patrol today, since he assumed Chaos was training the warriors. Well, at least he hoped she was. He had been doing his best to get to know the pack one on one lately, but he needed some time to himself right now. Since the loner presence was heavy near the banished lands, he relaxed a bit as he reached the ridge. It was unlikely that he'd find any issues here, since the terrain was nearly impossible to traverse. His gait was slow and relaxed, obviously enjoying the peace and the beautiful landscape. It had been a while since he last simply enjoyed himself. The last time he could remember had been when he and Rayne had talked by the springs. That had been several days ago, and he had been longing for it ever since. He closed his eyes as a soft breeze ruffled his fur, a soft sigh escaping his muzzle before his eyes opened once more. Looking up from her marks, Terah caught a new scent in the air. It had an authoritative feeling to it, and the female knew she would find a pack member. A high ranking pack member, at that. Rising to her feet, she jumped up onto a high ledge to get a better view. Ah, there it was. A large artic wolf with a great white coat. He was a big wolf, strong as they come. He seemed to want to be alone, and this was a logical spot. Except for the fact that Terah was there. She gave a small bark, calling out "Hello there!" while bounding down to ground level. She briefly wondered what he did in these packlands, taking note that he looked as old and worn down as she did. Blitz lifted his head at the sudden bark from the female, looking in her direction. She looked rather friendly, and since she bounded down to meet him, he came to a stop. "Hello." He said softly, sitting down and tilting his head slightly. "I wasn't expecting to find anyone over here today." He said, studying her for a few moments. She appeared to be older, but not old enough to be run down and weak like some others he had seen. He himself was getting up there too. "I'm Blitzen, alpha male of Silverlight, this lands." He said, smiling and wrapping his tail around his paws as he watched her curiously for a few moments. Terah came to a stop in front of the male as he himself stopped. Oh! This was the alpha that she was meeting! How fortunate for her, maybe she would really find a place to stay for a little. It was just a matter of what kind of wolf Blitzen was, but so far he seemed okay. He was very calm in seeing her, which meant that he welcomed loners. Terah looked just beyond him to the wooded areas, curious about this Silverlight. Smiling, she sat down as well. "I'm Terah. A loner, clearly!" She wasn't too scared of what could come. This place had a certain aura to it. It was safe here. Blitz couldn't help but smile at her disposition. He didn't run into many loners that were this friendly and eager to meet another wolf. "It's a pleasure to meet you, Terah." He said, dipping his head slightly in a welcoming bow. "What brings you to Silverlight?" He asked, tilting his head to the side slightly as he studied her for a few moments. She looked healthy and to him, didn't look like she was a loner. She looked like she belonged in a pack, and from the way she behaved, she was a pack wolf at heart. They needed more wolves like that in Silverlight. But for now, he waited for her response, smiling over at her and listening carefully. "Pleasure to meet you as well!" Terah bowed her head in return to his welcoming. He seemed a calm wolf, a very welcoming one at that. He seemed to fit the role of alpha, in the minutes that she'd met him, she knew. She could tell in an instant. He seemed happy in the moment. "I'm not quite sure what brings me to Silverlight!" Her brain tried to wrap around some sort of excuse, but she decided to tell the truth. "I was only travelling alone and I wanted to know what was beyond these here mountains. It's beautiful here!" she ended with a smile. Blitz smiled as she spoke, tilting his head slightly at her response to his question. It was a reasonable response, but it didn't exactly give him an idea of how to move forward. "Well, Silverlight has been my home for quite a long time now, and I still haven't gotten used to it's beauty." He said softly, glancing back at his gorgeous home and then back at her. "Do you have a pack, Terah?" He asked curiously, wondering where she had come from and what her opinion on packs was. They could always use more members, especially because of the growing loner presence. Plus, she looked like a wonderful addition to their family. She reminded him of Fallon, always happy and uplifting. They needed more of that around Silverlight. Terah gave a small chuckle as Blitz told her that he hadn't gotten used to the beauty. It didn't surprise her, there was probably so much more to explore. It seemed like fun. When Blitz asked her about being in a pack, she responded, "Oh I used to have pack. I loved that pack, but have yet to find one that worked as well as it did." 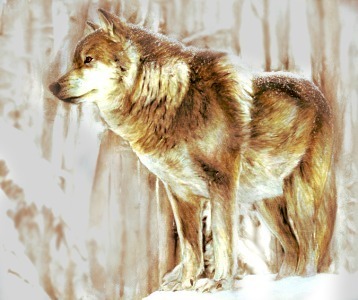 Her mind quickly went to her memories of the old pack, and she truly missed it. But nature has done it's duty, and taken the lives of pack members. Her ears fell back as she remembered, but she reminded herself that she was in the company of another. "Although, I would love to join your pack. If you'll have me, of course." Blitz was a bit surprised when she asked for acceptance into Silverlight. His tail wagged slightly as he tilted his head to the side a bit. "I would love for you to join our family." He said, purposely calling the pack a family instead of just a pack. That's how he saw it, anyways. These wolves were more than loyal subjects to him, much much more. They were wolves that he cared about and loved, and that he'd lay his life down for. Any time, anywhere. "What type of position might you be interested in? There's warrior, hunter, pup sitter, or healer." He said, knowing that they didn't need healers, but the other positions would welcome another member with open arms. Terah wagged her tail as Blitz told her that she was welcome to join. She liked that he called it a family. A pack should be a family anyways, related or not. It was just the way Terah knew it should be. Already, she liked this Silverlight pack. Her old pack had been a family and that was how she liked it. When Blitz asked her what kind of position she wanted, she was a bit surprised. She got to choose her position; that was very nice! In her head, she composed thoughts of each that Blitz listed. She would do well as a warrior, she had muscle and she was strong. She could make it. She was an alright hunter, enough to feed herself when she was alone. Although, she didn't quite have the agility she used to have. Pup sitting was always a fun job; it was fit for the old growing Terah. She also knew the basics of healer. Now that she thought of it, she had experience in all the categories. She could do anything here. "I'm up for being pup sitter! But if ever need be, I can be a warrior. Or hunt. And I knew a bit of healing remedies." Terah was rambling a little bit, but she wanted the alpha to know her skills. Blitz smiled as she rambled, listening silently until she finally finished. He had to admit, he was glad she had mentioned pup sitter. Cici really had her hands full with five pups running around the dens. "Well, we just had two litters of pups born into the pack this spring. We've only got one pup sitter, so your help in that area would be greatly appreciated." He said, wagging his tail lightly and smiling at her. The pups, Bleu and Bandit specifically, needed another set of eyes to watch them when their parents were away. They were getting bigger, and with that growth, there came much more mischief. "Welcome to Silverlight, Terah." Terah's tail continued to wag as Blitz mentioned that two litters had been born. Even for a pack, two litters could be a lot depending on how many puppies there were. Terah smiled back at the alpha and was actually quite happy to have a new home again. Even if only temporary, it was something. And it was a pack! She loved packs. "Thank you very much, Blitz. I'd be glad to help with the pups!" She tilted her head a little, questioning what they were to do next. Blitz smiled as she spoke, wagging his tail lightly and getting to his feet. "Well, I suppose we should head back to the dens so you can meet the pack, and your new responsibilities. I warn you, two of them, Bleu and Bandit, are quite a handful." He said, chuckling softly at the thought. He hoped she could handle them, because well, they were little monsters. He himself usually had plenty of patience for them, but well, not all the pack members could deal with their antics all the time. "The dens are this way. Welcome to the family, Terah." He said, waiting for her to join him and nudging her shoulder gently in welcome. He was glad to find a loner that was friendly and wanted to join. It was much better than the ominous and growing amount of faceless loners that were building up around the borders. Terah laughed as Blitz mentioned pups that were 'quite the handful.' Those pups were always the fun ones to take care of; Terah knew this from experience. Those pups would be adventurers when they grew up, they would be smart and cunning. As useful as that could be as a hunter, or a warrior perhaps, it was no use to a pup. And certainly no help to those taking care of the pups. As long as the pups didn't get to Terah's bad side, everything would be fine! When Blitz nudged her and led her in the direction of the dens, she followed. "How big is this pack?" She asked. Blitz turned to her as she questioned the size of the pack, smiling slightly. "There are 20 members, 21 now that you've joined." He said, wagging his tail slightly. He was glad the pack was growing, they'd need all the help they could get if the loner presence turned out to be dangerous. He hoped it wouldn't, but there was no way to be sure. He picked up the pace slightly as they neared the dens, coming to a stop at the location where Chaos had tackled Molly, growling slightly at the blood on the ground. That warrior was going to have to answer for this one. But when he entered the den area, he wasn't greeted with Chaos, but Coven, Molly, Fallon, Pravin, and a new male whom he had never seen before.